The other day, Tanya posted a poem as part of her Rhizomatic Learning inquiry. Entitled Agree/Disagree, the poem explored some of the dichotomies of learning. Tanya’s post itself, including the poem, is a real thoughtful look at what she has been pondering when it comes to online learning spaces, and I felt inspired by leave her a poem as a comment, referencing some of the phrases in her original poem. I also used Vocaroo to leave my poem for her as a podcast, and suggested that she podcast her poem, too. I often suggest that folks podcast small pieces of writing. Poetry works best, I think. For me, the words get transformed when I can hear the voice of the writer — the inflections, the phrasings, the timbre. I can’t say that many folks take me up on the offer, but Tanya did, although she used the opportunity to ponder more about podcasting. What I found interesting is her observation about voice and reading, and how, for her, the listening might impinge up her enjoyment or understanding of a text. That words on paper, or screen, give her more agency. That in the silence of physical voice, the voice of the writer comes through even clearer. (I am now making assumptions about what she was saying but her thoughts sparked some interesting questions in my head). Tanya’s insights and comments reminded me of a recent “album” by Beck (who has a fantastic new album coming out, by the way). Instead of recording his music and releasing it as musical files, he published it via McSweeney’s as a collection of sheet music. Manuscript files. Silent notes on the page. He wanted others to the ones making the music as they saw it, and not be influenced by his sounds. Thus, Song Reader. Tell me that isn’t cool? Lots of folks did record his songs, as featured on Beck’s Song Reader site. Which brings me back to our poems. Tanya’s and mine. As I listened to her podcast, which ends with her reading her poem, I realized that I could not let her voice just dangle in the air. Knowing she would not mind, I grabbed her audio file and together with my own poem file, I began a remix of our poems, weaving stanzas of her in with stanzas of mine. The result? A shared poem. Would this have been the same if I had put her words and my words together on the static page? No. I don’t think so. It was her voice and my voice, and later Mariana’s images, that transformed our work together, and made it something very different than the words on the page. Would it have worked as a poem on the page? Yes. Just not in the same way. Our voices are powerful means of communication, and we don’t use them nearly enough. If you read the provocative title of this post and thought, what rant is he on now, you’ll be disappointed. Go on. It’s OK. You can move on other blogs, if you want. Or stay. Please do. I’m happy to have you here. It’s the end of the Rhizomatic Learning course (wrong word for what it is/was) at P2PU and this week, facilitator Dave Cormier has us thinking about how we move off center stage and allow for learning to become the natural fabric of our lives, without structured support. How do we plan for “planned obsolescence” when we are the teacher or when we are the learner in a specific learning space? If, like me, you are a classroom educator, this is more of a June discussion (in New England, anyway) with summer approaching, not a February think when winter is still in full gear. Here, in February, I am still center stage with my sixth graders, guiding them as best as I can towards ways to think and write about their world. I hope something catches. In June, as the year winds down, I will be more contemplative — wondering, Did anything catch? Anything at all? Will they still remember our lens of thinking five, ten, 15 years down the road? Did I do what I set out to do? It’s difficult to have a rhizomatic thinking pattern when you in the midst of the learning. If these discussions have taught me anything, it is that simple fact. We have trouble making sense of the moments when we are in the moments. I suspect it takes a reflective stance and a larger-picture understanding of our place in the world to gain insights about what we have truly, deeply learned. Time forges on. Yet, learning experiences can also begin to fade, if we are not careful. We must have a forced-memory strategy, as a way to call back the experiences. I use writing. Words to remember. This blog space works in that vein. I am collecting ideas and reactions and reflections in this moment in hopes that later, I will come back and better understand what it is I was doing. I will. I do. Because right now, right here, as #rhizo14 ends — I don’t know what I have learned. Not yet, anyway. I began the #rhizo14 with a poem (see Zeega, above), about roots taking hold. Those roots? Still taking hold for me. Still. May those roots of new ideas keep working their way into my head, and keep finding new ways to transform the way I see the world so that, perhaps, some of that transformation seeps its way into my teaching, so that I may help transform the thinking of my students, whom may not even know it until years later. Roots often remain hidden until we suddenly realize they are in full bloom. It occurs to me as I write this post that some of the same ideas are also being explored, although slightly differently, in the Deeper Learning MOOC, too. There, we’re talking about to how create rich and meaningful learning opportunities, spaces and connections for students so that it just not a shallow scrape of the surface of ideas. Deep resonated with all of us — as teachers designing those possibilities in hopes that something will catch in the mind of kids and as learners trying to make better sense of the world and ourselves. What it takes to reach that point of rich learning is some faith on the part of the learner. Hope that our experiences matter. That we’ve gathered something important from our time spent together. That the shared journey holds us together. Roots take hold. We banter about the term “lifelong learners” in education quite a bit. It’s a hopeful sentiment — that the learning opportunities in our space will not just spill over in the lives of our students (I teach 11 year olds) but will provide the structure for self-centered learning in unknown situations at any given time in the future. In some ways, the younger the students, the more difficult this is because of the ways that technology and digital media are completely transforming the world (Remember the world of 10 years past?). We have no idea what the world of work and life will be like for my sixth graders when they graduate high school in six years or college in 10 years (more or less). To think otherwise would be foolish. But such conundrums open doors, too, if we don our optimistic lens. We have to be mindful of thinking practices that transcend the moment. Same here, with this course and others in open education. I can’t even articulate what I will take away from #rhizo14 because I may not even know I learned it until the moment I need it .. and remember. But I suspect seeds have been planted. I am optimistic that my time spent here, with everyone in conversation and creation, will be fruitful in ways I don’t yet know. In the unknowing is the hint of knowledge, right? The question to explore this week with the #rhizo14 course is the concept of “community as curriculum” and whatever that means. It brought up to my mind the continued tug and pull of what we mean by community when we refer to online spaces. And I was reminded of a presentation by Bud Hunt on the topic of community versus network spaces from the K12 Online Conference way back in 2008 (I think). Listen to Bud: http://k12online.wm.edu/k12online08lc09.mp3 and find some of the related resources at either the K12 Online Space or at his blog space. #Rhizo14 Provocation: Is Books Making Us Stoopid? I love how Dave Cormier provokes folks in the Rhizomatic Learning course to reconsider where we stand. This week, he takes the idea of “Google makes us dumb” and turns it on its head with the question of “are books making us stupid?” Which, of course, requires a response (Dave is a genius). I took a gander at what Terry had done in a mixed media response, and decided to make my own media piece, too. Thanks, Dave, and thanks, Terry. Over at the Rhizome Thinking community, the theme this week is about “independence” and learning. I’m been trying to think about this along a few varied paths. First of all, check out this student TedX talk about learning and using Minecraft as a place for inquiry and learning. Looking at the video and listening to the talk through this lens of “independent learning,” it occurs to me that the freedom this student has had to pursue his own path and make his own discoveries has opened up some interesting doors for him, and provided a way forward into a lifetime of inquiry. I love his reference to “play” and using blocks as kids. And his smile when he says “at the center of this course is a video game …” is priceless. Then, I think to my own sixth grade classroom. How much independence do I really give my students? I like to think I give more but I fear I probably don’t. Listening to Dave Cormier’s video at the Rhizome Learning site this week had me thinking about the environment of learning in my classroom, in my school, in my district. That all sounds great, and I agree. The difficulty in nurturing a truly independent classroom space is twofold. First is that teachers are under intense and increasing pressure to meet standards, and while one could argue the Common Core actually opens up plenty of avenues for student-led inquiry, there is still a stifling framework. These things must get done, is the mantra I hear in my head. The second point is related to the first, and a bit more alarming: students have been programmed to follow directions to the T and to submit work that meets the criteria exactly. I notice this a lot with mentor work that we look at for various assignments. I’ll bring in a piece of student writing or show them my own, and sure enough, when the projects gets handed in by students, they are like little replicas of the mentor texts (mini-writing-mes). Year after year of rules and testing and teaching to the test have created this rigid and rather inflexible set of learning ideas in their heads, and when given freedom and independence, a fair number of students seem unsure of what to do and where to begin. We’ve drummed out their curiosity for fear of failure, and we are all to blame. We actually ran into this with teachers, too, during a year-long Professional Development project that I co-facilitated in an urban elementary school. It was a school that had done so poorly on state tests that the state came in and oversaw curriculum and instruction, with canned lesson plans and scripted lessons. The teachers became like robots, delivering lessons that they had little investment in. Our project was completely based around classroom-inquiry projects, where teachers determined the topic of inquiry and then moved into it. For some, just shifting to this kind of thinking was a hurdle almost impossible to overcome. They didn’t trust their judgment anymore as teachers. It literally took months of support and inquiry and modeling to break them free of those shackles and become independent thinkers again. So what can we do as teachers to help nurture our students? Keep opening up doors for students to be passionate about ideas (I often look to the work of Paul Allison and Youth Voices for how this might unfold). Remain flexible as a teacher about students being interested in things you know nothing about (ie, Minecraft). Model for students what inquiry looks like — not just at the end with a finished product but from the start with the brainstorming that leads along many different paths. Trust that the grading/assessment may be important in moment but is of very little importance for the student’s life. Allow for independence, even in a system where conforming to rules and practices and standards is common practice. Over in the #rhizo14 learning space, the topic for the first week is all about “cheating as learning,” which is a fascinating way to get started with an inquiry conversation. Imagine my surprise when, as I was spending a few days mulling over this concept, this issue of Time for Kids comes to my classroom during the week. It’s all about cheating in school. Now, as far as I know (and really, we don’t really know unless someone is caught), not too many of my sixth graders cheat on test and projects. 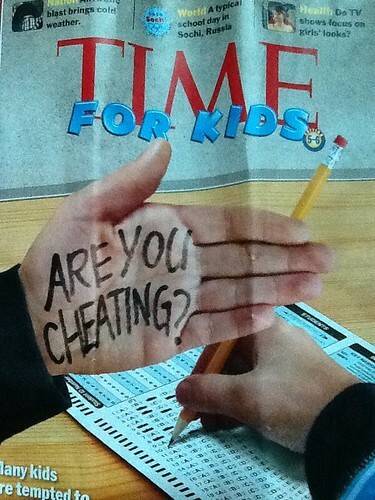 But the article opened up an interesting conversation with my students about why kids would cheat (not them, of course — ahem). They articulated worries about grades, and expectations of teachers, and the need to prove themselves and keep up with friends. Even at this young age, they carry a lot of weight on their shoulders most of the time. “Teachers assume it’s independent work unless they tell you otherwise. But students assume it’s collaborative work unless you are told it is not.” — Tricia Bertram Gallant, co-author of Cheating in School: What We Know and What We Can Do. That was a real eye-opener for me … because I think it is true. Students are natural social collaborators (look at how they flock to social networking sites) and during work times, they naturally gravitate towards each other. Am I always crystal clear on what is acceptable for collaboration and what is not? I think so, but maybe not. It’s a matter of perception and point of view, and perhaps one person’s view of “cheating” is not everyone’s point of view. We’re also wrapping up our science-based video game design unit, and what I find so interesting is that “cheat codes” is part of the DNA of gamers and gaming communities. I have a few students who walk around with magazines about how to hack Nintendo games to find Easter Eggs, gain access to hidden levels, and more. Just Google “cheat codes,” and you are bound to come up with a wide array of responses. Gamers don’t see this kind of cheating as negative. They see it as sharing expertise, and helping others who get “stuck” in a game to succeed. But if this were the classroom, and one student was “stuck” on a test, it would not be acceptable practice for another student to hand out “cheat codes” for the test, right? Of course not. We see this a lot with our work on our gaming site (Gamestar Mechanic) where you have to make your way through a series of Quests in order to gain experience with game design and earn publishing rights. Many students turn to classmates for advice, help and even beating levels for them. This is acceptable practice for both sides: the giver of experience and the receiver of help. But you can see where the dichotomy of ‘the world inside school’ and ‘the world outside of school’ are often in conflict for students. Finally, I am in the midst of reading a fascinating book. Fakebook (subtitle: A True Story. Based on Actual Lies) by Dave Cicirelli is all about the author deciding to play a trick on friends by creating a fictional story of his life and sharing his experiences on Facebook. In this fictional life, Cicirelli quits his job and hikes west, gets in trouble the Amish and who knows what else (I am about a third of the way in). As I work my way into the first week of a P2PU course around open learning and Rhizomatic Learning, I’ve been thinking again about who owns what in the digital landscape. This connects to the theme of “cheating as learning” in the first week and about the ways in which Terry Elliott and I have been remixing our words this week. I have another idea related to my classroom to write about another day. Yesterday, during a writing time with students, I started this poem, trying to get at the heart of what it means to be a writer releasing a work into the wilds of the Internet. It became a nod towards Abbie Hoffman’s Steal This Book and the open culture of remixing and making meaning on your own terms. I tried to “perform” it in a the rhythm of a slam poem, with short rhymes and lines, and a quick pace. 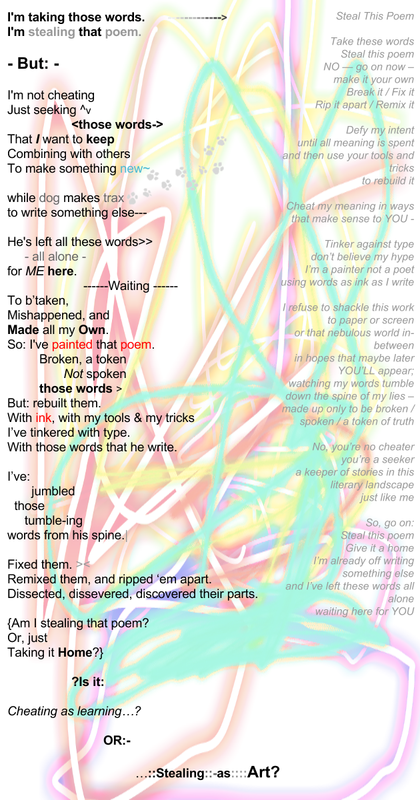 I’d love to think of some cool way to represent the poem digitally beyond the podcast but my brain is empty right now. How about you? Wanna take my words and remix them? 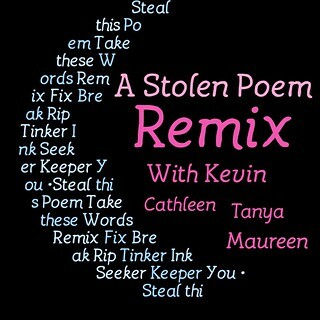 Wanna steal my poem? The invitation is there to do what you want with my words, including ignoring me.